Riverside County Office of Education (RCOE) developed the Student Annual Needs Determination Inventory (SANDI) Assessment, a comprehensive alternative assessment system for students with significant cognitive disabilities, and needed to formally test the reliability and validity of the assessment to encourage broad adoption nationwide. reliability and validity of SANDI. Hanover’s analysis found that the full value of the SANDI goes beyond that of other current alternate assessment options to provide a larger framework for guiding the kinds of communication and collaboration that effective alternate assessment requires: defining appropriate standards, differentiating instruction to meet those standards, and accurately observing the success of such efforts in providing students access to those standards. The analysis also confirmed that the SANDI assessment demonstrated technical quality across each content area, showing correlation with other key alternate assessment instruments, internal item content validity, and inter-rater reliability. Can demonstrate the reliability and validity of the SANDI assessment to K-12 education organizations nationwide. Used findings in the analysis to develop the SANDI Technical Manual to support district partners in the implementation of the assessment. Hanover was a true partner with us throughout this process. They provided step-by-step support in demonstrating the efficacy of SANDI as a fully-developed, comprehensive student assessment system. The SANDI is a comprehensive online system of capturing data through effective student assessment and delivering meaningful standards-based, data-driven instruction. Riverside County Office of Education has been on the leading edge of strengthening instructional programs and assessment for students with significant disabilities. 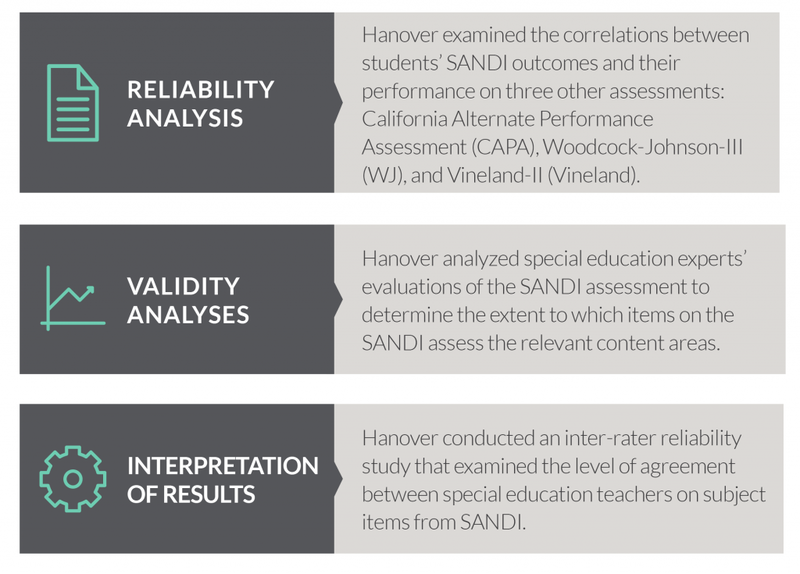 Hanover Research has validated RCOE’s Special Education Needs Determination Inventory (SANDI) as a viable, evidenced based tool in this process.